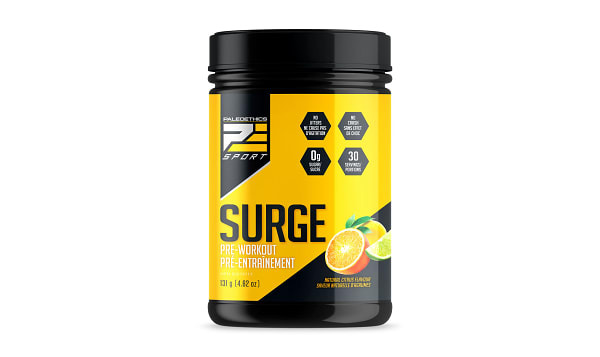 Surge is a no-nonsense formula containing energizing ingredients that come exclusively from all-natural sources, without the addition of any fillers or heavily processed substances. This translates to a healthier boost in energy without the unpleasant side effects. No jitters, bloating or restless nights, just the clean energy you need to perform. Because Surge doesn’t contain any caffeine or processed additives, you won’t experience any anxiety, distracting thoughts, or a racing mind. Naturally replenishing and energizing ingredients mean you can look forward to a clear mind and a focused workout. Say goodbye to the restlessness, heart palpitations and upset stomach that often come with highly caffeinated supplements. Say hello to clean, long-lasting and crash-free energy. Thanks to ingredients like ginseng, this blend will give you a natural energy boost while still allowing you to feel relaxed after your workout. This product traveled 4144 km to reach our warehouse. Paleoethics aim is to help you achieve your health and fitness goals by delivering an exceptionally nutritious range of high-performance supplements suitable for any lifestyle.